At the 2017 International Astronautical Congress in Australia, SpaceX founder Elon Musk laid out some exciting changes to his vision for helping make humans an interplanetary species, with a presence on Mars and potentially beyond. Musk also detailed progress on some of the more concrete aspects of the plan it showed off last year.It showed a stress test of its large cryo fuel tank, which you can see above. The explosion came only after the tank endured beyond the limits of SpaceX’s anticipated field conditions. SpaceX also showed off the company’s rocket engine tests, noting that the longest continuous burn test for the so-called Raptor engine is 100 seconds, but that 40 seconds will be typical for Mars landing requirements. Regarding the propulsive landing required for landing on Mars, Musk noted that SpaceX has been perfecting that with Falcon 9 – “That’s what they’ve been doing across 16 successful landings in a row,” he said.. “And that’s really without any redundancy. The Falcon 9 lands on a single engine, he added and when you have high reliability with single engine, then you can land with either of two engines (which the BFR will have), and you probably can achieve landing reliability on par with most commercial airlines. Musk also noted that the precision for propulsive landing is now good enough that the company probably doesn’t even need legs for the next version – it can land with enough precision the rocket will land back on its launch mounts. Another key ingredient will be ramping up the rate of launches, since a very high frequency will be required for Mars. SpaceX is targeting 20 launches by the end of this year, 30 by next year. “If SpaceX does do something like 30 launches next year, it’ll be approximately half of all orbital launches that occurs next year on Earth,” Musk said. One more ingredient that’s coming along will be automated rendezvous and docking to a space station. 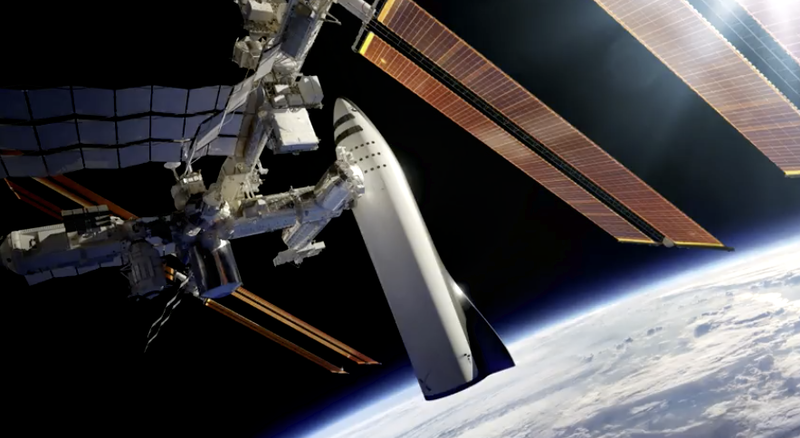 Dragon 2, which launches next year, will achieve that with the International Space Station, Musk said. The current version of Dragon needs the Canadarm to finally affix it to the ISS docking station. Musk reiterated that Falcon Heavy should launch by the end of this year. He qualified that it sounds like it should be easy, since it’s effectively a tripling of Falcon 9, he said, but “it’s actually not.” But the boosters have been tested and are en route to Cape Canaveral, and SpaceX is now beginning serious development of BFR. BFR in fully reusable configuration should have a payload capacity of 150 tons to low Earth orbit, Musk revealed – which compares to 30 tons for Falcon Heavy in only partially reusable configuration. This makes a huge difference in terms of cost, since even with partial reusability you’re still throwing away much of Falcon Heavy to get that load up to space. With BFR, SpaceX is essentially combining the upper stage of the rocket and Dragon in one craft. High reuse will allow the cost of launches to drop below that of the most cost-efficient current launches, while still keeping costs lower than any other current launch. Refueling in orbit will further help with this cost efficiency, and the automated docking component is a big part of making that happen in a way that maximizes benefits. The plan is still to build ahead and have a stock of Falcon 9 and Falcon Heavy vehicles, despite the future focus on BFR, so that SpaceX’s customers can be reassured they can use this. Meanwhile, once that stockpile is achieved, SpaceX will turn all attention to building next rocket, which it will pay for by launching satellites and servicing the ISS. The BFR, once in service, can also deploy large satellites, pick up space debris, and service the space station, but SpaceX wants to ensure that customers aren’t made nervous by the new platform before extensive testing. “It’s 2017, I mean we should have a lunar base by now – what the hell’s going on,” Musk said on stage. What is going on, indeed. The initial Mars goal is to have landed at least 2 cargo missions on Mars by 2022, per the SpaceX CEO. The company will start building the first BFR ship in the next 6 to 9 months, and Musk “feels confident” they can do the first mission in about five years. The purpose of the initial missions will be to confirm water resources and spot hazards, and to put in place power, mining and life support systems to support future missions. Further missions following in 2024 would fly four ships, including two cargo vessels and two crewed ships. During this stage, the goal will be to build a propellant plant as well as take the first people to mars, and to build up a base in preparation for an expanded surface presence. And then to build that into a city, blossoming across the red dirt of Mars. The numbers and cost planning here still require a long hard look, but it’s hard to deny the appeal of the plan, fantastic as it may be. Plus, Elon saved maybe the best, and most down-to-earth (and yet maybe also most lofty) goal for last – commercial spaceflight that could get passengers anywhere on Earth in under an hour.